Today more so than ever before, our bodies are suffering from unnecessary wear and tear due to unhealthy lifestyles. Our diets, largely consisting fast food, lack essential nutrient, while the hustle of a busy schedule leave a little for an active, healthy-promoting way of life. Add to that chronic stress, insufficient sleep, and increased exposure to dangerous toxins and pollutants, and it's easy to find yourself in a devastating noxious cycle. Chronic inflammation, stemming from this unhealthy cycle, can lead to some very serious health conditions. For men, prostate health is near top of the list of Health Concerns that can arise from poor health. If this walnut-sized gland is not cared for, it can lead to urinary problems, sexual dysfunction, of any number of other prostate concerns. prostate health. Quercetin and lycopene have also been added in levels that are properly balanced with these critical nutrients to provide complete prostate support. ​The good news is that Forever Living has formulated two superior-quality products that offer true health solution for both men's and women's special health needs. Women’s Vitality Supplement is specifically designed with a woman’s needs in mind. 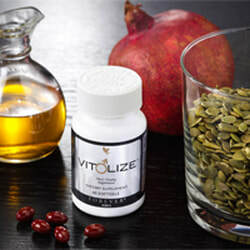 Vit♀lize™includes a proprietary blend of botanicals including apple powder, passionflower and schisandra berry. Each of these botanicals has been used for centuries to balance hormones and support overall health and well-being. delivering the nutrients to the lower gastrointestinal tract where they can be absorbed through a time-release mechanism. are easily depleted by stress and common medications including birth control and hormone replacement therapies. These vitamins have been combined with patented forms of iron and calcium, two critical minerals for women’s cardiovascular and bone health. These nutrients have been properly balanced to provide complete support. ​For women, an area of great concern is hormone imbalance and over-all being. Poor diet and lifestyle can add to any number of symptoms related to hormonal imbalance, including urinary tact infections, sexual dysfunction, PMS or menopausal effects.